Ideally located in the heart of Phu Quoc Island, only a short walk from the spectacular beach, the hotel offers panoramic views of Dinh Cau Palace…. The Tropicana Resort welcomes you to its peaceful and exquisite resort on Long Beach Phu Quoc Islan. The Tropicana Resort, covers an area of 20,000 m2 with beautiful privatte beach allows the clients total privacy and shelters the guests from all noise & pollution of modern life. The resort has 28 bungalows and 6 rooms are gracefully decorated in the traditional Vietnamese style with high grade wood and luxurious rattan furnishings, all set amidst coconut trees on a white sandy beach. Sea Star Resort is located at Ba Keo, 1 Ward, Tran Hung Dao Street, Duong Dong town, Phu Quoc District, Kien Giang Provine. With convenient location, The Resort overlooks the sea as bring you a comfortable, pleasant feeling and romanticism… when coming here. Together with those minutes, we want to bring you an easy and close space, bring to busineesmen, tourists a space to enjoy and relax after hard working days. One side is cliffs, the other is Bai Truong sandbank spreading out to the horizon. In front of you, the sky and the sea intermingle with countless twinkle stars, the stars of sky and fishing boat where man and nature come together. - Thousand Stars - name of new resort which is located in the windy hill, with harmonious architecture, with animal statues set up meticulously along a road to the bedrooms, seafood restaurant, fresh water bathroom, changing rom by the sea. 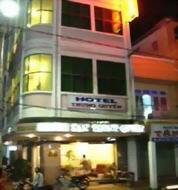 - Located in the center of Phu Quoc Town, 100m to the PhuQuoc Airport . 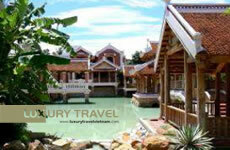 - From Rach Gia 2 hours speed boat and by the airlines approx.35 minutes in reaching Phu Quoc island. Located in the center of RachGia Town. 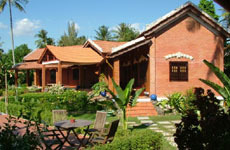 Cassia Cottage Inn on Vietnam's Phu Quoc Island, your ideal location for a Vietnam vacation. Have three large plantation villas, with sea view and five brick Garden cottages for travelers who wish privacy while having all their needs provided for. 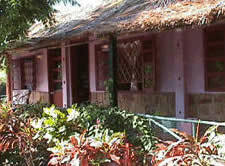 Cassia Cottage Inn is the resort you’ve dreamed of.